MANILA, Philippines – Just a few days after comedian Ogie Diaz shared his ‘open-letter’ to ‘networking people,’ a known networker reacted and answered on Diaz’s allegations. 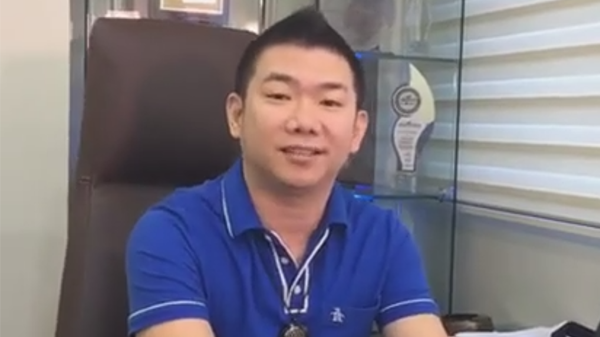 On Thursday, a certain Joseph (JLIM) Lim has released a live Facebook video to respond on Diaz’s accusations on Multi-level Marketing (MLM), commonly known as networking. Lim, a known networker from Alliance in Motion (AIM) is one of the top MLM leaders under 30 in a poll in 2013. In the video, Lim lauded himself as a proud networker that's why he felt obliged to answer Diaz’s post. Lim has admitted firsthand that the networking’s system is not perfect. First, Lim cried foul on Diaz as he described the ‘networking people’ all and the same. He then asked respect from the latter. Lim has explained Diaz’s call on opting a property or a condo than a car. The networker questioned, why would a house and lot or a condo would make any difference. He explained the importance of vehicles for networkers for commuting on daily basis. Taking similarity to a celebrity’s need for vehicle or a grandiose car with other facilities as part of business. For Lim, a car for networkers is too part of their business. Lim also called on people criticizing networkers for commonly flashing their earned money, and vehicle. That should too comment on nurses who put RN’s (Registered Nurse) in front of their names, to doctors who wants to be called ‘Dr.’ and to schools whose parents boasts their child’s honors. He summarized that the networking industry is like any other profession and it’s just that networking earns more money, faster and much more practical. “Sa mga nagsasabi naman na “bakit may mga taong nag-aral, after nag-aral parang na-be-brainwash na sa networking?” I think hindi po tamang term yung na’brainwash’. For me ang tamang term, nagising lang po talaga sila sa katotohan.” (For those who say “why there are some people after their studies seemed to be brainwashed by networking?” I think brainwash is not the right term. For me, the right term is that they realized the truth.) Lim said. In the live video, Lim stated what hurt him most on Diaz’s post is wherein the networker as lauds himself rich should just treat his prospect in a more fine dining—even treat him for a steak. Lim narrated that he himself has nothing to eat when he started networking. He fears that Diaz’s influence as a celebrity would likely leave a misconception that prospects would expect more from the networker. With no assurance if the prospect would really join. “Sa akin nalang, last word ko nalang is—be careful. Sa mga networker, keep it up. 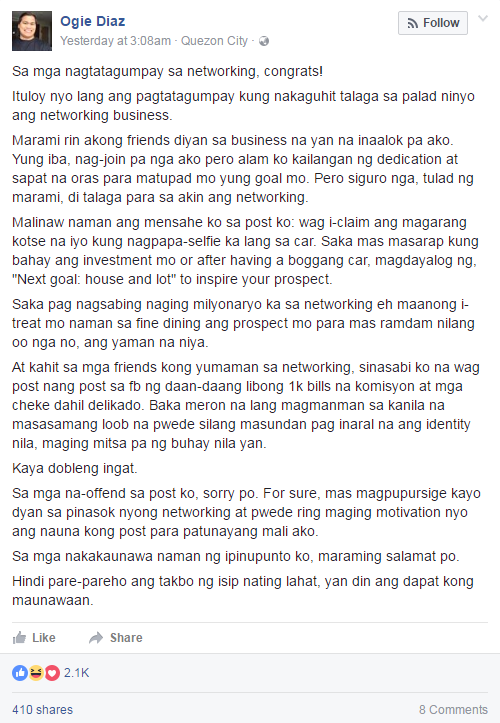 Sa mga networker naman po na hindi maayos ang ginagawa niyo, magbago na rin po kayo kasi nakakadamay po kayo ng mga tao na maayos po ang ginagawa naming sa industriya ng networking. We love this so much…” (For me, my last word is just—be careful. To all the networkers, keep it up. To networkers that are not really doing the right thing, mend your ways as others who are doing the right thing in networking will be affected.) Lim said in the viral post. Just yesterday too, Diaz apologized to those he has offended in the viral post.